I'm hoping someone may be able to give me some guidance with a print quality issue. My Ultimaker 2 printer has been printing without issues for several months, and seemingly overnight the print quality greatly decreased. 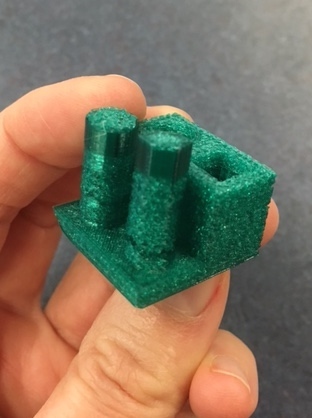 The infill is no longer printing well-supported internal structures. 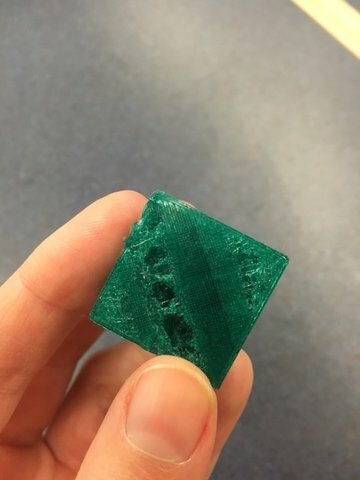 The result is a weak print that often breaks in half when being removed from the build platform. I've adjusted the speed (faster/slower), material flow (faster/slower), build plate temperature, material temperature, and I've changed filament, all to no avail. No other settings were changed when this print quality issue appeared. This is even happening to .gcode prints that came with the printer - MiniCalTest & Ultimaker Robot. It was a very sudden change, and I'm not sure what caused it, or what other settings I should try to adjust. I've attached a few photos that show the current print quality. Firstly I would do a few Atomic pulls to make sure there is nothing blocking the nozzle. If it still prints bad after that it might be time for you to replace your PTFE coupler. Some versions of cura have the infill set higher speed then the outer layers so you see under extrusion there first. Looking at your green test block it looks as though it was printed to cold and the top bit that looks good is hotter due to less cooling time. Thank you for the guidance, Labern! I performed atomic pulls until the filament looked clean and smooth. The exterior of my prints (specifically the bottom) looks much better now. However, the infill grid is still of very poor quality - as can be seen in these photos. Is the next step to replace the PTFE coupler? Check all the speeds in cura. Make sure they are all the same. The infill might be set to a faster speed then the inner and outer walls. And have temp at 190deg. 3 walls thick and 0.1 layer height.